Please Be My Fashion Police - Are You Finished Yet? This is going to be short and sweet. The Listen To Your Mother St. Louis Show is just 10 days away, and this girl needs to figure out what she will be wearing on stage. Now, rock your vote in the comment section! Thanks! **Update** Want to find out which look won? See the winner HERE! Don’t want to miss a post? Want to stay updated on my author events and news? Subscribe to my Weekly Mayhem newsletter HERE! 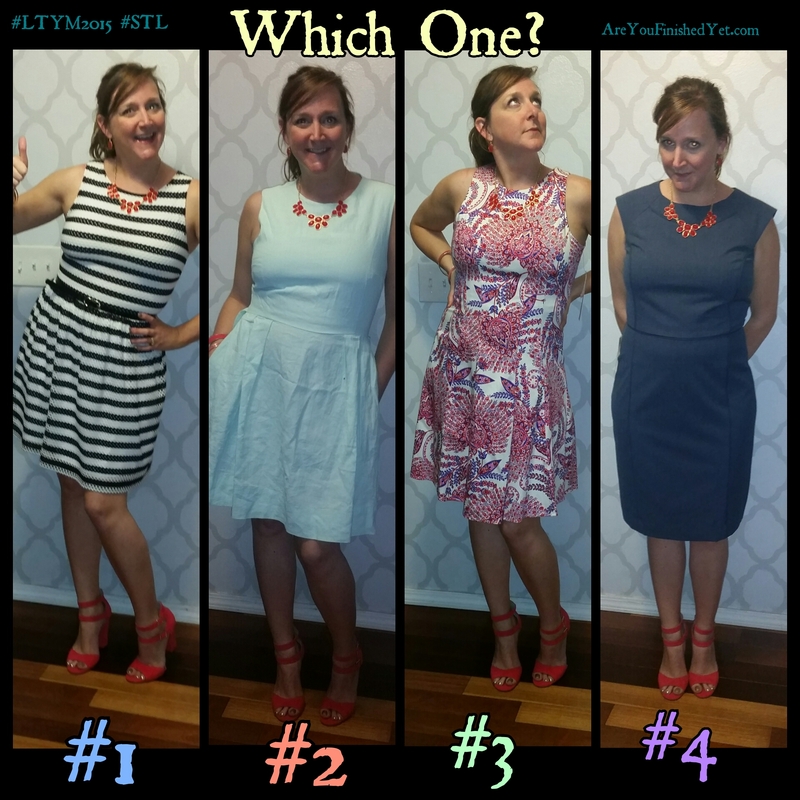 All gorgeous outfits but I prefer #4… But all look great! #4 is a good one! Thanks! Both good options. Choosing is harder than I thought! I love number 3 but for TV and on camera number 4 works best. Best wishes!! You may be right. I do love the classic look of 4. Plus I look like an important person wearing it. #1 I loved that one!!!! 3 would be my first choice, next is 4. Those shoes look incredible! I would have to say #3 as my first choice and #4 as second. Have fun! Thanks, and yes…the shoes. I don’t think I’ve every loved any shoes as much as I love these. Thank you! It IS a good shoulder dress. #4… Classic, beautiful and not too busy. I vote for the “Holier-than-thou” facial expression in #3. Can’t help you pick a dress though. The good news is that expression goes with all four dresses. I’ll be sure to include that as one of my accessories. I think you might be right about the camera part…thanks! I would pick no. 3. I am sending your article to Ginny Baldridge to take a look at. She does fashion professionally. Maybe she would have an idea not only which outfit she likes but stage presentation.#3 is slimming for the camera; #4 lets people focus on you rather than the dress but the dress is really professional looking for a budding author! Best wishes, looking forward to the presentation. Thanks! I could use her input! its #3 or #4 for me!!! 3 is eye catching and fits you really well! Thanks! I loved actually having more than one dress fit well…that usually isn’t the case. I got lucky this time! #4. The necklace and shoes pop. Classic and shapely. You’ll be on stage and you want people to listen to what you’re saying not be diverted by your wardrobe. The other 3 are cute but better suited for a garden party or graduation party. Who doesn’t love stripes? Well, I guess some people, but I’m not one of them! I am impressed you were able to find FOUR DRESSES that look so great on you, Kelly! (Teach me your ways…) Being a practical gal, I would go with #4 for its versatility. #3 is a very close second, though. 4 does have hella versatility, which gives it some bonus points. And I was shocked I found four dresses as well! That never happens. And the secret of my ways is: Nordstrom Rack (dresses 1 and 3), Gap (dress 2) and Limited (dress 4). Go figure. #1 for a fun, out-there image; #4 if you’re aiming to look sophisticated and/or demure. The baby blue is very pretty, but unless you’re magic, you are guaranteed to drip something on it sooner or later … and the flowers render the necklace invisible. Ha!!! You are probably right about dripping something. Noted! Well, I probably shouldn’t assume that everyone is as klutzy as I am… but that blue is clearly magnetic! #3 or #4 but I think #2 would look really cute in Mother’s Day pics! Right on! I do that all the time! First off, you look fantastic in all of them! I LOVE #2 and second choice would be #4. I can’t wait to see whatever fabulous-ness you choose in person!!! Yay! So glad you are coming! It is a great color combo for sure! Offering my “used to be a pr lady and taught people how to dress for the camera” advice. Keep it simple, so the floral, though it looks GREAT on you, is out. White is too “hot” looking (it’s distracting as there is such a large amount of a reflective material–not that you’re large). Stripes are dangerous. They can vibrate on camera. They look awesome on you, but the viewer will have a hard time with them. I’d wear that to something public that won’t be telecast. That leaves us with number 4, which would be my number one for TV. The color is flattering, but not distracting and the necklace brings the focus to your face. God bless you for knowing what you’re talking about! My indecisive brain needs a dose of rationale. Thank you!! You’re welcome! But you have to buy the floral dress for date night. All very cute! I can’t decide between #3 and #4.
thanks! I do love that one! Have fun – whatever you choose will be great!! It’s honestly most important that you FEEL great in it. Thank you!! I felt pretty good in all of them, but I think you’re right. I need to go with my gut. #1 for sure. Super cute with the black and white and color pop! I agree with the or lady….but buy the floral too because you look awesome in it! Yep, I concur with ‘used to be a pr lady’ and ‘Honour’— #4 for your show, but get the floral for you! I also like the way you think! Thank you!!! For the vote and the wishes! I love me some stripes… buuuut, I LOVE #3!! Lookin good, momma! I wish I had your figure! Working up to it! I can’t wait to read more posts on your blog! Aw, you are sweet. And the secret to my figure is called “spanx” 🙂 But thanks. I felt really good in all four dresses, and that was the best thing. I’d love to see you back in the comment section! #2 and I love the shoes! I Won, Now It’s Your Turn: Mother’s Day Giveaway | Are You Finished Yet? You look fabulous in all of them but my favorite is #3!